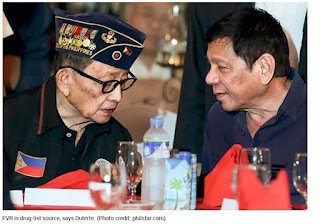 President Rodrigo Duterte has uncovered that previous President Fidel Ramos was his hotspot for the names of the administration identities purportedly included in the illicit medication exchange. In a discourse conveyed before the Filipino people group in Laos Monday night (Sept. 5), Duterte said Ramos went by him four times in Davao City to persuade him to keep running for president. Amid their initially meeting, the President said Ramos indicated him nothing aside from let him know that it's opportunity that he ought to run so Mindanao will have its own particular president. "The second time, he was unequivocally asking me to run. Sabi niya, 'ikaw lang ang makapigil nito kung papano.' Then he demonstrated to me a rundown ng mga—nandoon na, mga officers—sa droga. Pati pulis, gano'n kakapal, hindi ko dad binitawan 'yung iba kasi vina-approve ko dad," he said. Despite the fact that Duterte was reluctant to keep running because of absence of assets, he said Ramos was tenacious. "Sabi niya (Ramos): No. On the off chance that you continue cannot, this nation will go to the canines." Pinakita niya, what would you be able to do with this? Sabi ko, nakita ko mga officers, gano'n. Hindi naman associated 'yun. Pati yung kay De Leila, hindi yun associated," the President said. Duterte let out a stunner days in the wake of taking office when he uncovered that five dynamic and resigned police commanders as far as anyone knows have connections to the unlawful medication exchange.